Mutaguchi, Y. and Ohshima, T. (2015). Purification of a Protein Exhibiting Isoleucine 2-epimerase Activity from Lactobacillus otakiensis JCM 15040. Bio-protocol 5(20): e1632. DOI: 10.21769/BioProtoc.1632. Prominent accumulation of D-leucine, D-allo-isoleucine and D-valine was observed in the culture medium of the heterofermentative bacterial species, Lactobacillus otakiensis (L. otakiensis) JCM 15040. The racemase enzyme that resulted in this accumulation, isoleucine 2-epimerase, was purified from the bacterial cells. This is the first reported observation of such production of D-branched chain amino acids in lactic acid bacteria, and the first example of a racemase with isoleucine 2-epimerase activity in any organisms. In the described protocol, we introduce methods for purification of this protein from L. otakiensis JCM 15040. Because no specific ligand that has high affinity for this enzyme has been identified, the purification was performed using ammonium sulfate fraction, four types of column chromatography and preparative Native-PAGE, not using an affinity column chromatography. We hope that the protocol will provide useful information for purification of an enzyme that cannot easily be purified using an affinity column chromatography. Note: Pack 50 ml of TOYOPEARL Phenyl-650M resin in a chromatography column (diameter: 2.5 cm, length: 10 cm) (Tosoh Bioscience LLC, catalog number: 14478 ). Note: Pack 50 ml of TOYOPEARL Butyl-650M resin in a chromatography column (diameter: 2.5 cm, length: 10 cm) (Tosoh Bioscience LLC, catalog number: 07477 ). Note: Pack 50 ml of TOYOPEARL SuperQ-650M resin in a chromatography column (diameter: 2.5 cm, length: 10 cm) (Tosoh Corporation, catalog number: 17227 ). Note: Unless otherwise indicated, this buffer is used as the standard buffer throughout the purification procedures. Note: According to Recipes, prepare Red Sepharose CL-4B resin by attaching Reactive Red 120 (Sigma-Aldrich, catalog number: R0378-50G ) to Sepharose® CL-4B (Sigma-Aldrich, catalog number: CL4B200-100ML ). Pack 10 ml of Red Sepharose CL-4B resin in a chromatography column (diameter: 1.5 cm, length: 12 cm). Prepare 5 test tubes including 10 ml of MRS medium for preculture. Inoculate a part of a colony of L. otakiensis JCM 15040 into each MRS medium (10 ml) in the test tube. The preculture is performed statically at 30 °C for 36 h.
The main culture is started by addition of the preculture media (10 ml x 5 tubes = 50 ml) into 10 L of MRS medium. L. otakiensis JCM 15040 is cultivated statically at 30 °C for 30 h in an incubator, after which cells are pelleted by centrifugation (8,000 x g for 30 min at 4 °C). The cell pellet (ca. 32.2 g, wet weight) is used as the starting material for purification of protein exhibiting isoleucine 2-epimerase activity. Unless otherwise indicated, all purification procedures are carried out at room temperature, and the enzyme solution is stored at 4 °C. To prepare a crude extract, the cells are washed twice with about four volumes (120 ml) of the standard buffer, and suspend in 120 ml of the same buffer. On the occasion of the washing, the cells are collected by centrifugation (8,000 x g for 30 min at 4 °C). Next, they are disrupted using a Multi-Beads Shocker (2,500 rpm for 60 sec at 2 °C, 5 times), and centrifuged (10,000 x g for 30 min at 4 °C). The resultant supernatant (100 ml) is used as the crude extract. The crude extract (100 ml) is mixed with two volumes of 3.6 M (NH4)2SO4 dissolved in the standard buffer. After incubation on a magnetic stirrer for 4 h at 4 °C, the mixture is centrifuged (10,000 x g for 30 min at 4 °C), and the supernatant (280 ml) is retrieved. The collected supernatant (280 ml) is applied to a TOYOPEARL Phenyl-650M column. This column chromatography separates proteins on the basis of hydrophobic interactions between the proteins and the resin. Before the supernatant is loaded, pre-equilibrate the column with 10 column volumes (500 ml) of 2.4 M (NH4)2SO4 dissolved in the standard buffer. After the loading, the column is washed once with three column volumes (150 ml) of the same buffer and proteins are eluted using a linear gradient of 2.4 to 0.4 M (NH4)2SO4 in the buffer [used buffer: 250 ml of the buffer with 2.4 M (NH4)2SO4 and 250 ml of the buffer with 0.4 M (NH4)2SO4]. 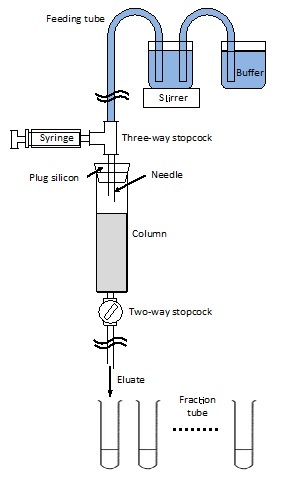 The elution is performed at a flow rate of about 1 ml/min, and 50 fractions including about 10 ml of elute are collected. Assay the enzyme activity in each fraction (see section B “Isoleucine 2-epimerase activity assay” below), and choose five active fractions showing higher activity than other fractions. The five active factions (about 50 ml) are mixed, and then dialyzed against 100 volumes (5 L) of the standard buffer at 4 °C. After 4 h, the standard buffer (5 L) is changed and dialysis is continuously performed at 4 °C for 12 h.
This first dialysate (60 ml) is mixed with two volumes of 3.6 M (NH4)2SO4 dissolved in the standard buffer, and the mixture is applied to a TOYOPEARL Butyl-650M column. This column chromatography separates proteins on the basis of hydrophobic interactions between the proteins and the resin. Before the supernatant is loaded, pre-equilibrate the column with 10 column volumes (500 ml) of 2.4 M (NH4)2SO4 dissolved in the standard buffer. After the loading, the column is washed once with three column volumes (150 ml) of the same buffer, and proteins are eluted using a linear gradient of 2.4 to 0.4 M (NH4)2SO4 in the buffer [used buffer: 250 ml of the buffer with 2.4 M (NH4)2SO4 and 250 ml of the buffer with 0.4 M (NH4)2SO4]. The elution is performed at a flow rate of about 1 ml/min, and 50 fractions including about 10 ml of elute are collected. The five active fractions are pooled and dialyzed as described above. This second dialysate (60 ml) is applied to a TOYOPEARL SuperQ-650M column. This column chromatography separates proteins on the basis of ionic interactions between the proteins and the resin. Before the supernatant is loaded, pre-equilibrate the column with 10 column volumes (500 ml) of the standard buffer. After the loading, the column is washed once with three column volumes (150 ml) of the buffer, and proteins are eluted using a linear gradient of 0 to 250 mM NaCl in the buffer (used buffer: 250 ml of the standard buffer and 250 ml of the buffer with 250 mM NaCl). The elution is performed at a flow rate of about 1 ml/min, and 50 fractions including about 10 ml of elute are collected. The five active fractions are pooled and dialyzed as described above. SDS-PAGE of this third dialysate shows that this dialysate includes not only isoleucine 2-epimerase, but also a putative NAD+-dependent alcohol dehydrogenase (data not shown). To remove this NAD+-dependent dehydrogenase, the third dialysate (50 ml) is applied to a Red Sepharose CL-4B column. Because the red dye immobilized in this column binds to a wide variety of NAD+- and NADP+-dependent enzymes but not isoleucine 2-epimerase, the NAD+-dependent enzyme and isoleucine 2-epimerase are separated by pooling the flow-through of this column chromatography. Before the supernatant is loaded, pre-equilibrate the column with 10 column volumes (100 ml) of the standard buffer. After the loading, the column is washed the column once with three column volumes (30 ml) of the standard buffer. During sample loading and column washing, the flow-through (about 80 ml) as the active fractions is pooled. The resultant enzyme solution is then concentrated to 300 μl using an Amicon Ultra centrifugal filter 3 K device, and then the concentrated enzyme solution is stored at 4 °C. Native-polyacrylamide gel electrophoresis (Native-PAGE) of the concentrated enzyme solution (300 μl) is performed on a polyacrylamide slab gel for further enzyme purification; 30 μl of the enzyme solution is loaded on each of 10 lanes. The electrophoresis is performed using the method of Laemmli (Laemmli, 1970) with some modifications; buffers without sodium dodecyl sulfate are used, and the protein sample is not heated during the pretreatment procedures. After electrophoresis using a constant current of 20 mA for 90 min, the gel is cut into 16 pieces using a cutter and a ruler. The gel pieces are individually crushed in 300 μl of the standard buffer using Biomasher II, and the resultant solutions are centrifuged (17,000 x g for 15 min at 4 °C) (Figure 2). The enzyme activity of the supernatants is assayed and the active enzyme solution is used as the final purified enzyme solution from L. otakiensis JCM 15040. Prepare the first step reaction mixture in 1.5 ml tube. The composition of the first step reaction mixture is shown in the following table. Run this reaction for 1 h at 30 °C. The 1.5 ml tube containing the reaction mixture is incubated in a water bath. Boil the first step reaction mixture in 1.5 ml tube for 10 min, and thus cool it to room temperature. Prepare the second step reaction mixture by adding reagents shown in the following table into the first step reaction mixture. Run this reaction for 15 min at 37 °C. The 1.5 ml tube containing the reaction mixture is incubated in a water bath. Apply the second step reaction mixture to a spectrophotometer, and thus measure absorbance at 500 nm. A measurement of the reaction mixture without the enzyme solution is used as a blank data. For choosing active fraction, the enzyme activity is rapidly assayed by the following 2 step reactions (Figure 3). 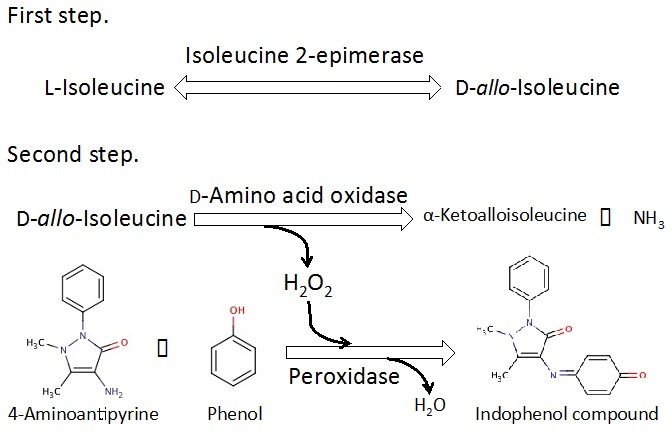 At first step, isoleucine 2-epimerase reaction with L-isoleucine as a substrate produces D-allo-isoleucine. At next step, D-amino acid oxidase-peroxidase coupling reaction is performed. In this coupling reaction, D-amino acid oxidase reaction produces H2O2 in oxidization of D-allo-isoleucine, and thus peroxidase reaction produces indophenol compound (λmax: 500 nm, ε: 6.39 mM-1.cm-1) from 4-aminoantipyrine and phenol using oxidation power of H2O2. The isoleucine 2-epimerase activity is indirectly assayed by increase in absorbance at 500 nm occurring from the indophenol compound production. In this method, we have modified Laemmli’s method for Native-PAGE. In addition, this work was supported by a grant for Promotion of Basic Research Activities for Innovate Bioscience from the Bio-oriented Technology Research Advancement Institution (BRAIN) and JSPS KAKENHI Grant Number 2402734. Ohshima, T. and Sakuraba, H. (1986). Purification and characterization of malate dehydrogenase from the phototrophic bacterium, Rhodopseudomonas capsulata. Biochimica et Biophysica Acta (BBA)-Protein Structure and Molecular Enzymology 869(2): 171-177. Laemmli, U. K. (1970). Cleavage of structural proteins during the assembly of the head of bacteriophage T4. Nature 227(5259): 680-685. How to cite: Mutaguchi, Y. and Ohshima, T. (2015). Purification of a Protein Exhibiting Isoleucine 2-epimerase Activity from Lactobacillus otakiensis JCM 15040. Bio-protocol 5(20): e1632. DOI: 10.21769/BioProtoc.1632.